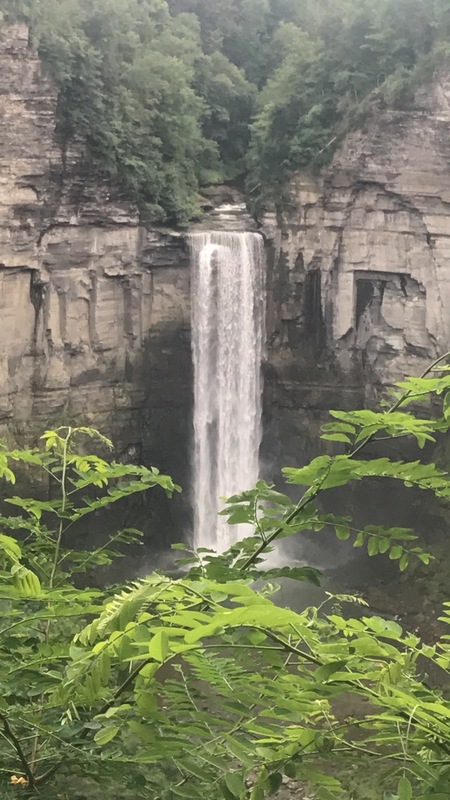 Taughannock Falls State Park is located in Trumansburg, NY and I struggled with which category this fell under for me since it is only about 2.5 hours away from home (Buffalo, NY) and my friend Courtney and I did this as a day trip. Kinda local, kinda not. So I put it under both! Courtney and I just so happened to both have the 3rd of July off so we left at 7AM for a mini road trip! 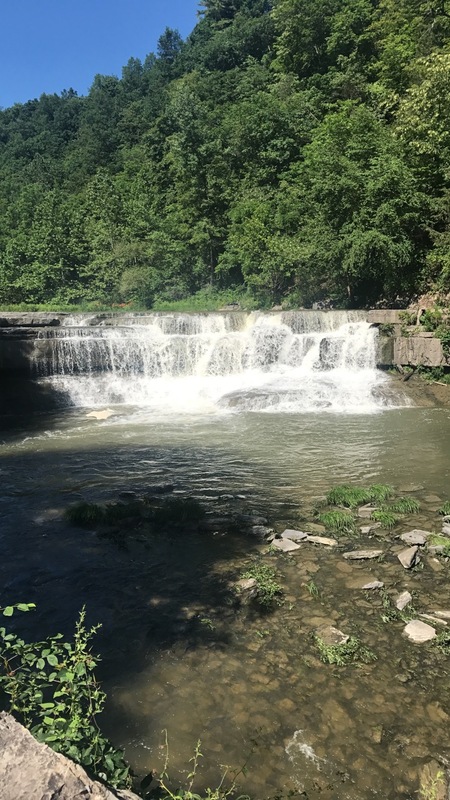 The main attraction at this park is the waterfall which is about 215 feet tall with rocky cliffs that are almost 400 feet tall and tower over a beautiful gorge. There are a couple different trail options here. 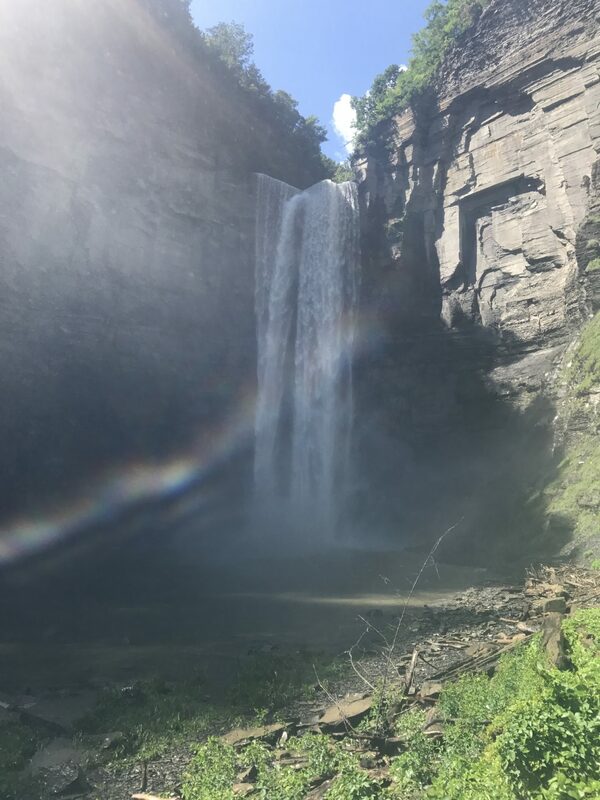 We wanted to get to the waterfall nice and early since it tends to be a popular attraction so we took the gorge trail first that leads you right to the bottom of the waterfall. This is a very easy .75 mi walk along the creek to the base of the waterfall. There were plenty of families with kids doing this one and you pass a much smaller, lower fall on the way. For how easy the walk is, the view at the end is amazing! You can get close enough to the waterfall to get pretty soaked especially when the wind is blowing just right, which it was. Or if that’s not your thing, you can hang back and just appreciate it from a foot bridge. I would recommend getting soaked. It’s more fun. After we felt satisfied with our view down below the fall, we moved onto the upper rim trails. The South Rim Trail is just over 1 mile and the North Rim Trail is about 1.5 miles. These two trails link up to create a loop so you can do both, which is what we did. These trails are more moderate. There was some steep climbing in the beginning but then it does eventually smooth out a bit and you get peeks of the waterfall from up top. It was a much more peaceful hike than the gorge trail with less traffic, mostly through woods. We also wanted to check out the overlook point above the waterfall which was super pretty! Again, it was a little more crowded but definitely work checking out and takes hardly any effort to get to. Just down a flight of stairs and you’re there! Lastly, across the street from the trails heads is definitely a scene worth viewing as well: Cayuga Lake. 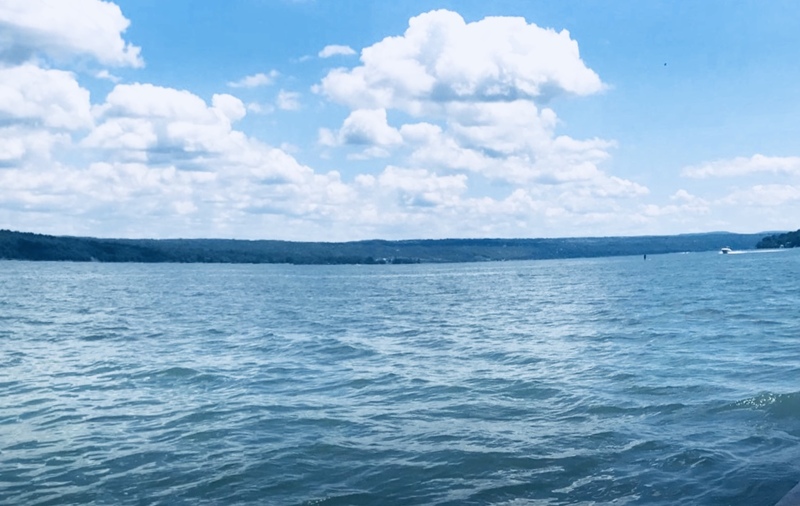 For those who aren’t familiar with the area, Cayuga Lake is one of the famous Finger Lakes. The whole area is completely gorgeous. This lake is one of those mind-blowingly beautiful ones. It was super hot that day so it was nice after all that hiking to be able to take our sneakers off and dip our toes in the super clear water. The water level was pretty high the day we went so there was a shallow pool like area of paved concrete that we could walk around on. Be careful though, its slippery and we almost had some unfortunate mishaps. I will say though, if I WAS going to fall accidentally into a lake, this would be a top choice. After a few hours of adventuring and deciding we weren’t quite ready to head back into the car just yet we stopped for some food and one of our favorite things in the whole entire world: MARGS. We found a Mexican restaurant in nearby Ithaca, NY (btw Ithaca rules and is one of my favorite areas to day-trip to – more posts on that later) called Old Mexico Restaurant & Cantina. This place totally hit the spot. Then we were off and home by dinner time. I wanted to post about trips like these because I’m a big advocate of making time to get out and explore. Day trips like these prove that you don’t have to take time off of work or life to make the time. Do a mini road trip for a day or explore places that may be even closer than that right in your backyard! I promise it’s not only worth it but NECESSARY. You need time to reboot and the fact that a trip like this allows you to do that while getting some vitamin D, seeing some amazing things and getting a little bit of cardio in is pretty wonderful. So just do it! 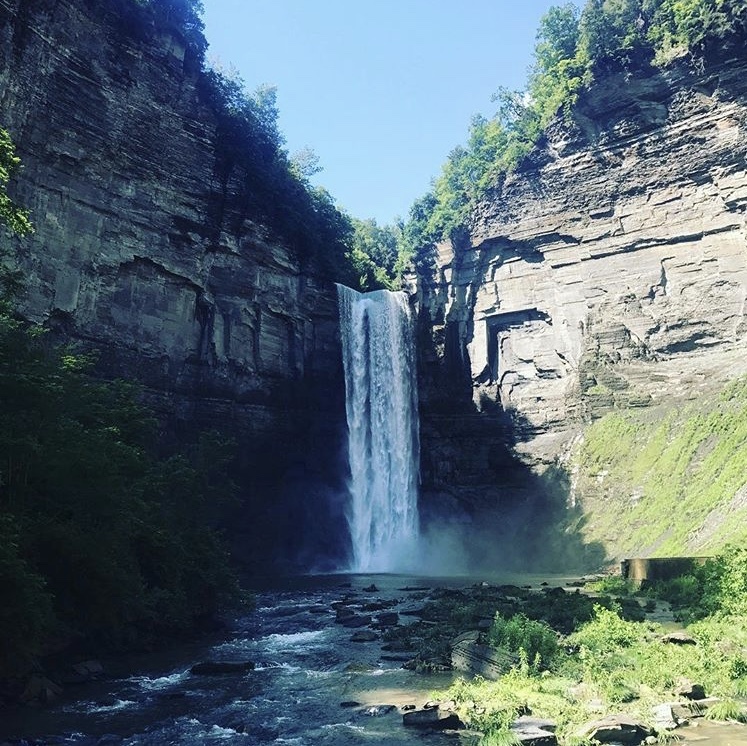 I’ve been to the finger lakes twice in the last two years, and have yet to do any hikes. That *may* be due to the wine consumption that happens there, however. These are gorgeous. Definitely will hike next time. 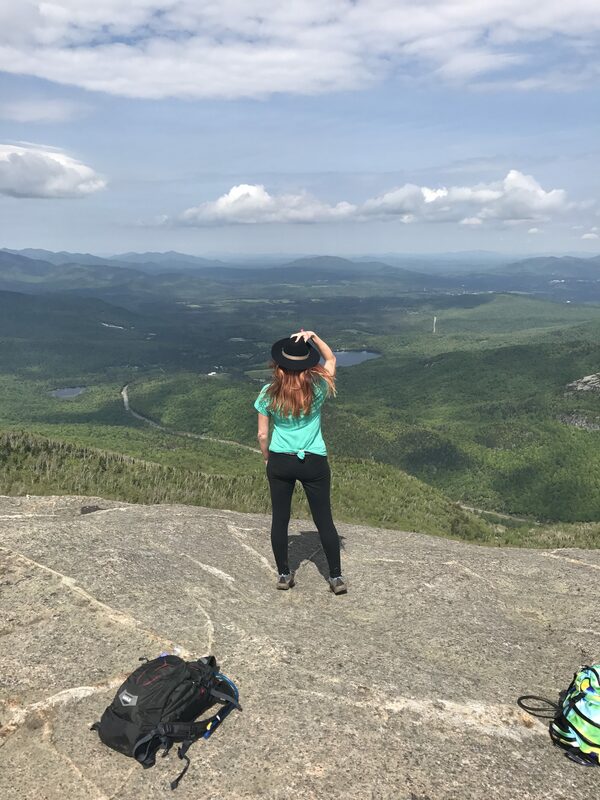 There are SO many good hiking spots in the region! But I do understand wine can be distracting 😉 I’ll be doing a post about a Finger Lakes weekend soon! I can’t imagine where my restlessness came from! Great write up and I love your nice breezy style of writing that makes your travels sound like a lot of fun. It was a good idea to think of places that aren’t going to cost people a whole paycheck to explore. Keep up the posts.